Local 871 is proud to join with other organizations in the Labor Movement in the fight for affordable Healthcare for all Americans. Labor United for Universal Healthcare is a coalition of nearly forty California unions, worker centers, and allied groups committed to building a healthcare system that is sustainable, secure, and just. The primary purpose of the Labor Campaign for Single-Payer Health Care is to increase and coordinate grassroots labor support for a Single-Payer Medicare-for-All healthcare system in America because we believe that health care is a fundamental human right and that the labor movement must take the lead in the fight for healthcare justice. Healthcare-NOW is fighting to win a national single-payer healthcare system because access to healthcare is basic to human dignity. To win, we must build a powerful social movement through education and action, so our work focuses on raising up the voices of patients who feel isolated in their struggles with the healthcare system, educating activists to gain the knowledge and skills they need to become leaders, and mobilizing our movement through collective action. SB 562 is a universal single-payer healthcare program that would provide publicly funded and progressively financed healthcare coverage for all California residents with no network restrictions, deductibles, co-pays, or other limitations on necessary care. A single public body -- the Healthy California Program -- would pay for the healthcare costs of all California residents (instead of an array of private insurers). What is the Healthy California Act (SB 562)? “FIX IT: HEALTH CARE AT THE TIPPING POINT,” details the way rapidly rising health care costs are hurting working women and men across the country. This video offers a powerful solution in the form of Single Payer "Medicare for All." The IATSE health care event on January 30, 2016 “FIX IT: HEALTH CARE AT THE TIPPING POINT,” along with a panel of guest speakers. The videos on their website capture the guest presentations that followed the “FIX IT!” video. Healthy California is a campaign of over 4 million Californians building a statewide movement to win guaranteed healthcare for ALL California residents. We represent over 150 community and labor organizations made up of nurses, teachers, patients, doctors, union members, business leaders, faith and immigrant rights community, progressive political organizations, healthcare advocates and providers, to ensure healthcare is a human right in the Golden State. Mission: To build and broaden a grassroots movement to replace private health insurance with guaranteed healthcare for all Californians. 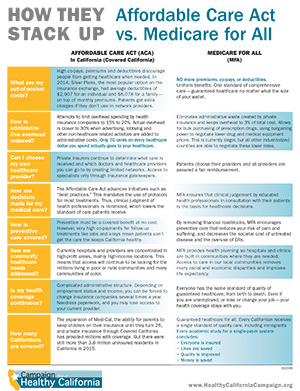 View the Fact Sheet for the National "Medicare for All" Debate, provided by the Campaign for a Healthy California (CHC), a community and labor coalition of organizations (representing over 4 million Californians) committed to building a grassroots movement to replace private health insurance with improved Medicare for All in California.